an eminent Hebrew scholar, was born at Gamache in Picardy, in the early part of the sixteenth century. In 1531 he was appointed regius professor of Hebrew in the university of Paris, one of the royal professorships at that time founded by Francis I. and in this office gained the highest reputation. Among his hearers were many learned Jews, who much admired his lectures, which were all delivered extempore, nor does he appear to have committed any of them to writing. Some of his scholars, however, having taken notes of his observations on the Old Testament, Robert Stephens made a collection of them, which he added to Leo Juda’s version of the Bible, printed at Paris in 1545. Of their accuracy no doubts have been entertained, although Stephens probably might correct what he thought the errors of the transcribers. Yet as a protestant translation was joined to them, the doctors of divinity of the faculty of Paris condemned them, while those of Salamanca, with more liberality, caused Vatablus’s Bible, for such it was called, to be reprinted in Spain with approbation. 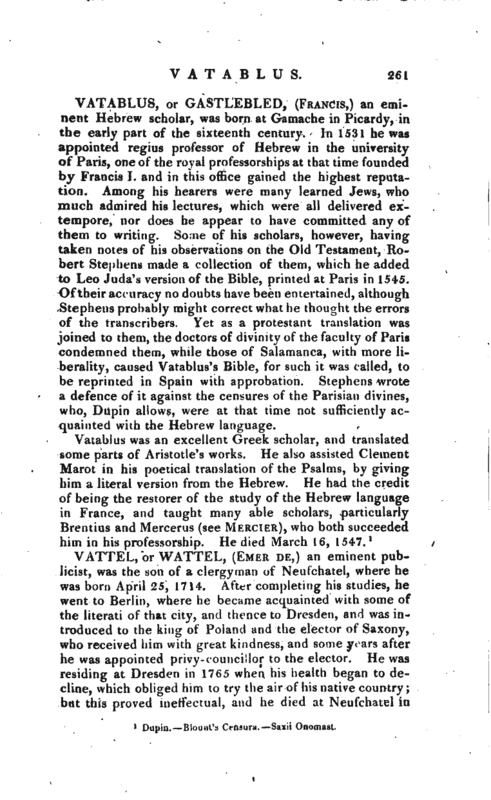 Stephens wrote a defence of it against the censures of the Parisian divines, who, Dupin allows, were at that time not sufficiently acquainted with the Hebrew language.